The UDC-3X charges Lithium Ion, NiCad, and NIMH batteries as well as AA and AAA. 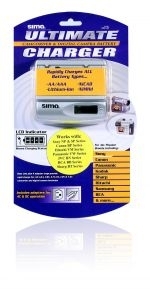 Sima's new Universal Charger, Model UDC-3X, delivers the power to quickly recharge your digital camera or camcorder battery. Our all-chemistry charger comes complete with 3 adapter trays to fit all major brands of digital camera and camcorder batteries including Sony, Canon, Kodak, HP, and more! It is equipped with an AC adapter and a car cigarette plug for use at home or on the go. Don't miss a great shot with a dead battery - takeCHARGE! � Rapid charges 3.6, 3.7, 4.8, 6.0, 7.2 and 7.4 V camera and camcorder batteries.